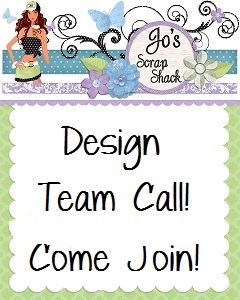 ~Jo's Scrap Shack~: DT CALL -- 2 More days left to apply!! DT CALL -- 2 More days left to apply!! We are having a DT Call and there is still 2 more days left to apply before it closes! If you have been sitting on the fence and thinking about it, just jump! I would love to see your beautiful work and everyone is welcome to apply! All levels of talent and even guys too! :) So if you would like to give it a shot, you can read all about it Here. Good luck!! !